There are more – and squishier – pumpkins in Vampires and Volts, but other than that it’s always Halloween at Castle Otherhand. It’s the kind of Goth/Halloweeny place that will never be normal, and where weird is the norm. The Raven Mysteries written by Marcus Sedgwick and illustrated by Pete Williamson are – as the name suggests – about a raven. He’s called Edgar. He is so me that we could be brother and sister and I love him. And as Edgar is my dear brother, I don’t have a problem with him being a raven, or even a bird. I’m so pleased that we can finish this Halloween week of horrors with something quite sweet and funny, while still a wee bit creepy. It’d be so easy to sniff at these books and dismiss them as brief entertainment for younger readers. They are extremely intelligently written; brief but using grown-up and mature words and sentence structure, which is the way forward for tomorrow’s readers. The humour in them is totally ‘adult’, and can possibly be explained by Edgar’s advanced years. He’s seen a lot. The Otherhands are somewhat careless with their staff. They have so many, but they do go through them slightly too fast. It doesn’t do to call the people who supply them with maids and footmen several times a week. They will run out of prospective employees before long. And it would look better if they seemed to care when yet a few more maids snuff it. Mum Minty is a wee bit lacking in the lady-of-the manor department for an ex-witch. Her husband is mad, but we expect husbands to be mad. Son Cudweed is dim and likes his food rather too much, but daughter Solstice is quite lovely. Goth and capable, and so articulate. Gasp. Gulp. And dear Edgar keeps them all going and assists at all times. 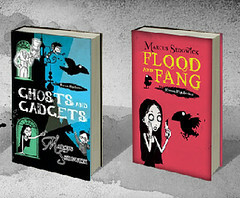 I read Flood and Fang when it first came out, and after that the Raven Mysteries piled up until I had a Raven weekend reading Ghosts and Gadgets, Lunatics and Luck, as well as Vampires and Volts, which is the latest one and out just in time for Halloween. But as I said, they are all Halloween books. And you don’t need to have read one before you read another. They stand alone very well. But you’d be an idiot not to read all. We all need some fun in our lives. It may be white, but it’s still a bird. A crow, even. And I do find birds more threatening than many other creatures. On the other hand, there aren’t any birds in Marcus Sedgwick’s White Crow. At least I don’t think so. And that’s just as well because this is a scary read. My heart bumped more and more as the book went on. It was never a case of giving up. It’s an easy read and a ‘must-continue’ kind of read. But a bumpety-bump sort of read. There are three stories in this novel. One is an old diary from 1798, written by the vicar in Winterfold. He talks mostly about his new neighbour, fresh from Paris, with experience of the guillotine. The two other tales are those of Ferelith and Rebecca, who are both young girls in Winterfold today. Ferelith is a strange girl who ‘befriends’ the lonely and angry Rebecca when she moves in for the summer. Ferelith is friendly and nice when it suits her, and quite sinister at other times. Rebecca’s father has work related problems which caused them to move to Winterfold, and which seem to accompany them there. Ferelith takes a lot of interest in the ruins of the big house where the Frenchman lived. Far too much interest. She wants to try things out with (on) Rebecca. And who is Ferelith really? It’s the hottest summer in living memory, but the chill in the soul is something else. This is the kind of book where the reader willingly assumes that nothing will be well at the end. Yes, and wasn’t that a good thing? 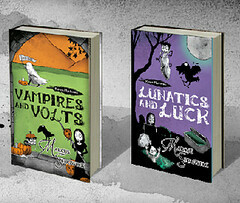 The wife’s book is short story collection Pretty Monsters and the wife is Kelly Link. It is still a read-in-progress, I have to admit. I’m about halfway in my self-inflicted period of horror and other lovely stuff. Pretty Monsters is pretty good. And monsterish. A monster just ate some American kid campers. I think. Most of them were pretty horrible anyway, so it doesn’t matter. I had read a story by Kelly before, without remembering her name. I’m not sure which anthology it was in, but I recognised it when I came across it. Kelly has a seriously weird mind, or she writes as though she does. The stories are interestingly different. What’s not to like about digging up your dead girlfriend, or skinless, ferocious dogs? I’m enjoying this collection, and I space the stories out, so I can’t start a new one when I’ve just finished the one before. They need digesting, and the mind needs to rest between the different kinds of weird. But as someone said last week, the good thing about short stories is that you can read one per day. 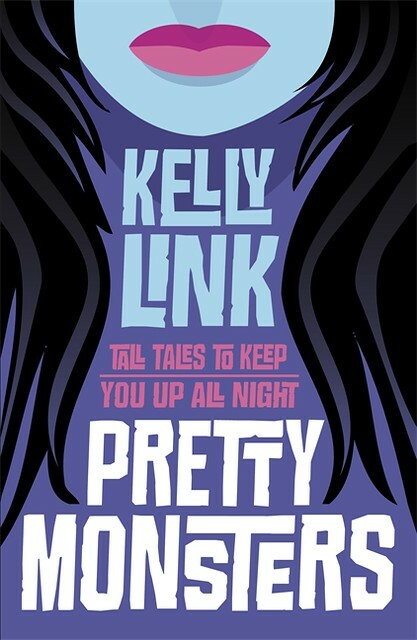 Pretty Monsters is one of the new Canongate/Walker co-published books for a crossover audience. At some point I will even read the novel I wrote off for in the first place. But it’s Halloween just once a year. Dark Matter is a successful cross between The Riddle of the Sands and The Call of the Wild, set in Svalbard. Michelle Paver’s first adult novel was published last week, just in time for anyone wanting to frighten themselves a little for Halloween week. No, I lie, it’s for those who want to be thoroughly and properly scared witless. Mentioning the books by Jack London and Erskine Childers is somewhat misleading, because they are more traditional adventure stories. Dark Matter takes the adventure story and moves it to Svalbard and adds ghosts. Set in 1937 it has a great period feel to it. Jack gets the job as wireless operator on an expedition to the Arctic region, as the only working class man of the group of five who set out. To mention class may seem snobbish, but it forms an important backdrop to what happens. The group begins losing members before they even leave. It’s very much a Ten Little N***ers kind of set-up. They are aiming for the remote Gruhuken, a long way from Longyearbyen. It goes without saying that Gruhuken is haunted. The locals avoid it all costs. Or at least, they did until the Englishmen arrive. Arriving in the short but light Arctic summer, it soon becomes very dark indeed. And the dark does things to you. Always wanted to be a witch? Me, but that’s because there is no need to want. 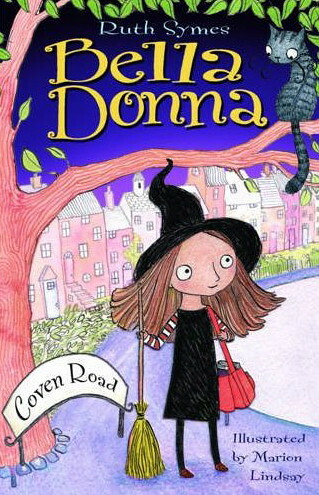 This short and fun book titled Bella Donna, about a young girl called Bella Donna is about wanting desperately to be a witch. Her name is really Isabella, but Bella Donna is witchier. She’s a little like Tracy Beaker; spunky and growing up in a children’s home. But there is no doubt she’s a witch. As a baby she even stole the dummy out of the mouth of her friend Sam through sheer wishing. They both want to be adopted, but are holding out for their own special Forever Family. Someone who feels just right. They must exist. Somewhere. Bella Donna needs someone who will accept her as a witch and Sam needs a family who love creepy crawlies. Does it happen? Well, Bella Donna ends up living with her FF in Coven Road, so what do you think? But all is not perfect, so read on to see what life as a small witch is like. I couldn’t resist this book, despite it’s intended target age of about seven or so. And you can always be a little pink, without any ill effect. My heart has resided in my throat for a little while now. It’s an uncomfortable place to keep it, but it’s Halloween. Or very nearly. I thought I’d go in for some horror and other scary stuff for a few days, but quite frankly had not anticipated being scared by Tove Jansson. The very last Moomin illustrations by Tove herself are about to be published in English as The Dangerous Journey. The story is in verse, which was first translated and then handed over to Sophie Hannah for some poetic English. And while I don’t know the original (though I did check online and found the odd quote, which looks just right) I feel the result is terrific. It’s the illustrations that make this book so marvellous. Though it’d be better to call them paintings, as they really are Art with a capital A. They are sort of scary, but so beautiful that you can just sit there and look at them. And look at them. The story is another matter, however. One Swedish reviewer pointed out that bedtime was not a good time. It’s about Susanna and her cat, and the little girl unwisely wishes things would be different. And the next thing she knows, they are. Scarily different. So she wanders off through this new landscape, seeing weird and frightening things, and meeting many of the characters from the Moomin stories, and together they walk on, still seeing a changed world. 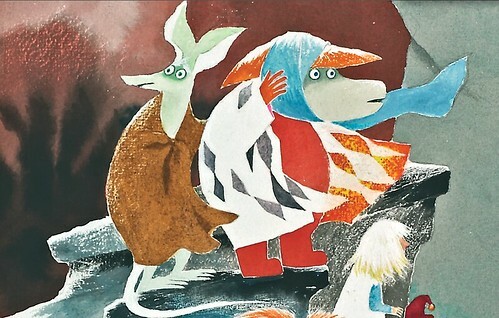 Until they suddenly find themselves in Moomin’s garden with all the regular – and friendly – people waiting for them. It’s like being in a book, she thinks. 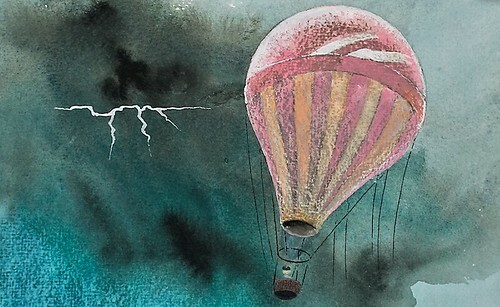 My heart is still up there banging away. But I do remember being read scary young children’s stories when I was small, so it could be that it’s just because I’m old that I feel like this. So at what age can one trust Offspring not to require more soft toys? Beanie Babies were at least quite small and more easily accommodated. We can’t totally agree whether Jethro is a Labrador or a Golden Retriever. But trust me, he’s big. On the other hand, I suppose he doesn’t bark. Or bite. By pure coincidence on this soft Labrador/Retriever adoption day I also read a reissued Corgi Pups book called Snow Dog. Really. It’s by Malorie Blackman and – since I don’t seem to have any information about the book – I’m guessing it’s part of an easy read series, for which it will be absolutely perfect. To be honest, the cover is too cute for me, but I can see that it would melt the heart of a young reader. The story however, is as woof-onderful as the dog in the story keeps saying. Nicky wants a dog but when her parents very sensibly say no, she and her Grandad bake a dog for her. And it’s magic. As long as it stays cold. As I was having an animal sort of day (if you’ve read CultureWitch you’ll be aware that we even had the vet calling) I also finished a second short and easy read by another giant in the children’s book world, Kate Thompson. Wanted! 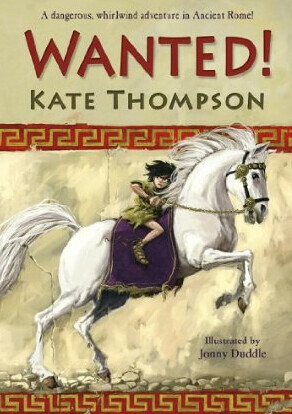 is set in Ancient Rome and is about the Emperor’s second-in-command who happens to be a horse. I felt so sure while reading it that it was true, because it rang a bell somewhere, but according to Kate’s notes at the end she made it up. Oh well. It features baker’s boy Marcus who unexpectedly meets Consul Incitatus, who is a horse. A very nice horse, but still a horse. Apart from this being a really good horse story there is some hidden political comment here. I’m sure. I think we could learn from this, how to choose our leaders. And as all you horse lovers out there know, horses are sensible people. Loving. True. Wanted! also provides a brief but fun look at history, served up so you almost overlook the fact that you’re being educated. Kate knows her horses. Meanwhile I’ll have my bell serviced.